They’ll get you on, then get you off. 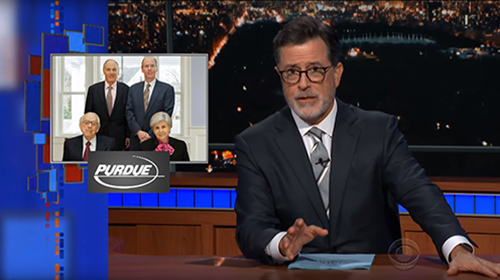 In the Late Night with Stephen Colbert September 14, 2018 episode (4:30 watch), “Colbert Links Big Pharma’s Sackler Family To America’s Opioid Crisis”, Colbert exposes the corrupt profit strategies of the family behind Purdue Pharmaceuticals, the makers of Oxycontin. Canadians who require pain relief are rarely ever provided an opportunity to make an informed choice about all of the options available to them, including natural health products and therapies which do not come with the inherent risk of misuse, addiction or death often attributed to chemical drugs. NHPPA sees a place for both pharmaceutical medications and holistic remedies in the marketplace but calls for more accountability for drug companies and Health Canada in their marketing and recommendations for use by the public. Credit must be given to Canada’s Minister of Health, Ginette Petitpas-Taylor, for writing to 102 manufacturers, distributors and affiliates requesting they stop marketing opioids to healthcare workers. Read the September 18, 2018 CBC article about Ms. Petitpas-Taylor’s actions to address the current opioid crisis this country. Of special note are the remarks of Canadian pharmaceutical policy expert, Dr. Joel Lexchin. In 2017, nearly 4000 Canadian deaths were linked to opioid overdose, an increase of 33% from 2016. The opioid epidemic is a hot topic in political circles. Tell your MP that you care about congruous accountability for all health products available to Canadians. Learn how to contact your MP. Protecting access to Natural Health Products and Dietary Supplements. By limiting its purpose to protecting access to Natural Health Products and Dietary Supplements, the NHPPA will focus on identifying and responding to threats facing the Natural Health Product and Dietary Supplement industry.